One of the Obama administration's final major labor regulations could deprive millions of retirement savers investment advice from financial professionals, according to a new report. The Department of Labor proposed the Fiduciary Rule in April 2015, which would allow regulators to oversee the relationship between retirement account advisors and their clients to ensure that the former were completing trades for the sole interest of their clients. The rule was approved in 2016 under the leadership of Labor Secretary Tom Perez, now the head of the Democratic Party. "In 2016, the Department took a historic step to protect the savings of America's workers—the conflict of interest rule makes sure that professionals providing retirement investment advice have to give advice that’s in the best interest of their clients and not divert their clients' hard-earned income into their own pockets through hidden fees and conflicted advice," Perez said in an exit memo published on the White House website. The Chamber of Commerce's Center for Capital Markets Competitiveness said in a new report that the regulation will have unintended consequences that could drive up costs for workers saving for retirement and prevent small investors from receiving financial advice from professionals. The regulation would give financial firms incentives to move away from commission-based management to fee-based management, which could hinder those with smaller accounts from gaining access to retirement advice because of the "substantial threat of unwarranted litigation." The report found that "up to 7 million individual retirement account (IRA) owners could lose access to investment advice altogether" and that 92 percent of investment firms "could limit or restrict investment products for their customers, which could ultimately effect some 11 million households." The report is based off of a comprehensive collection of surveys and data gathered by independent and industry groups, as well as public comments submitted to the Labor Department after it introduced the rule. It concludes that the department "underestimated the negative effects of the rule, particularly in reducing access to advice for small retirement savers and small businesses." "The theoretical academic exercises underlying the Rule are giving way to hard evidence, and the evidence is coming in showing that the rule is harming American investors. This new data, based on actual experience, demonstrates that the DOL's original predictions were wrong," the report says. "The DOL has overstepped both its jurisdiction and its expertise." President Trump ordered the department to review the rule in February as part of his deregulation agenda. 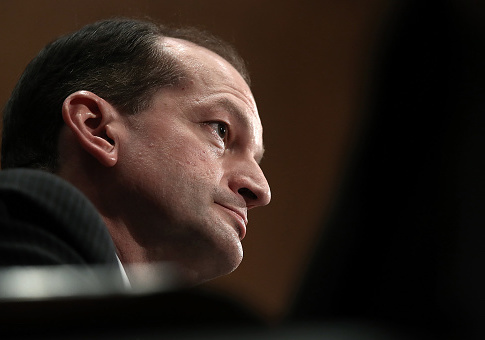 Opponents of the rule hoped that Labor Secretary Alexander Acosta would delay its implementation. Rep. Phil Roe, a member of the House Committee on Education and the Workforce, and 123 other congressmen sent a letter to Labor Secretary Alexander Acosta on May 2 urging him to "delay this rule in its entirety." Acosta indicated in a Wall Street Journal op-ed that the department would move forward with the rule, while leaving open the possibility of amending it. He said that he would follow through on Trump's call for a review of the regulation and seek additional public comment and input from the industry, as well as financial watchdogs. "Respect for the rule of law leads us to the conclusion that this date cannot be postponed," he wrote. "Trust in Americans' ability to decide what is best for them and their families leads us to the conclusion that we should seek public comment on how to revise this rule." Congressional Republicans have been critical of Acosta's decision to move forward with the rule. Rep. Virginia Foxx (R., NC), chairwoman of the House Committee on Education and the Workforce, said that delaying implementation "does not provide the relief workers and families urgently need from a deeply flawed rule." "If this is the path the department is determined to take, then it must quickly develop a responsible solution for dealing with a regulatory scheme that will make it harder and more costly for low- and middle-income families to save for retirement," Foxx said in a statement. "The last administration inflicted a lot of pain on workers, families, and small businesses, and it is going to take bold leadership to undo the damage that's been done and pursue a better course.‎"
The department will begin implementing the rule on June 9. This entry was posted in Issues and tagged Big Labor, Department of Labor, Regulation, Secretary of Labor. Bookmark the permalink.